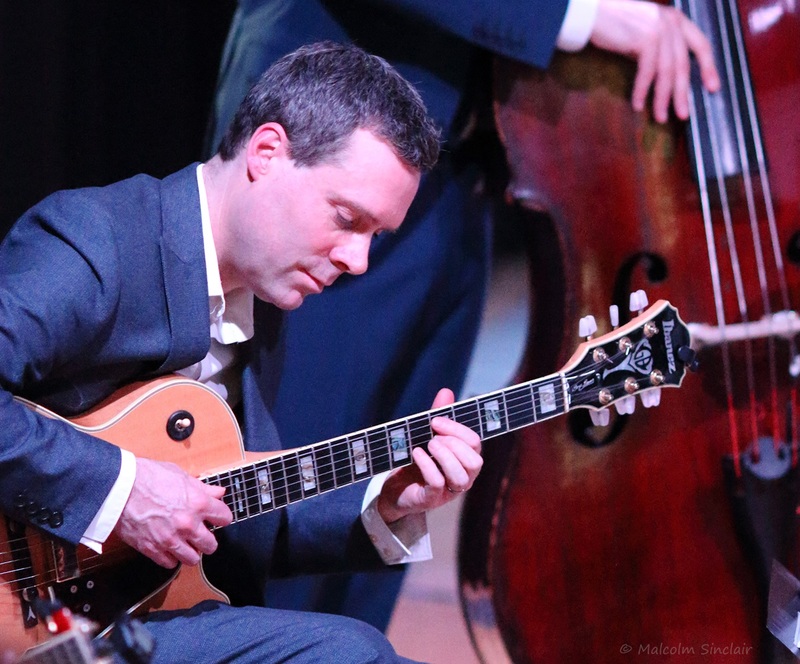 (Review & trio photo courtesy of Brian Ebbatson. Individual photos courtesy of Malcolm Sinclair). 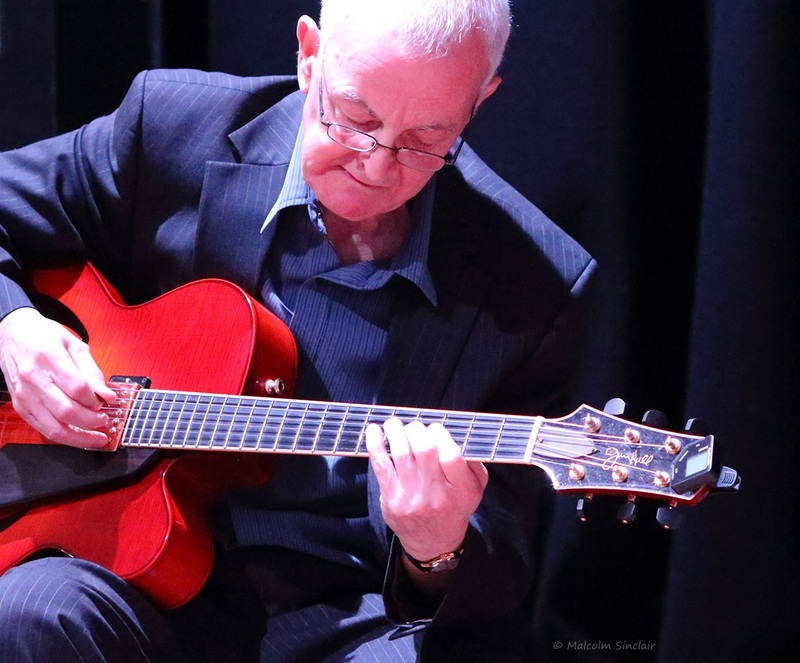 For the third concert of the 2019 Lunchtime Jazz series, the capacity audience at the Durham Gala was to be enthralled by a debut performance of the Giles Strong Trio, featuring the engaging and inventive playing of three musicians making their first outing together. Over the past 2 years (or more?) 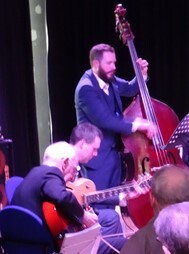 Giles and Roly have established a deserved reputation as a guitar duo, but this was to be their first opportunity to show their wares alongside the accomplished bass of Ian Paterson. The setlist too was a new departure. “This was all new material for all of us,” said Roly, “so this was its first outing. Giles did most of the hard work on the arrangements, but I tried to take some of the burden with a couple of pieces”. 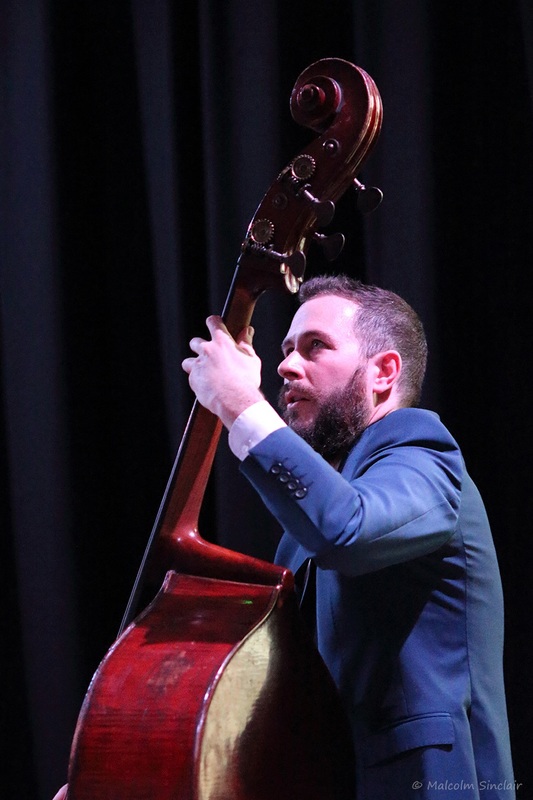 “The bass too is important,” he went on, “it provides much more than just rhythm and harmony, it is the anchor that holds the whole performance together”. This was clear from the first number, Gene de Paul’s I’ll Remember April, opening with a distinctive bass riff from Ian, leading Roly into the melody and an extended solo (‘That’s Jim Hall’, I wrote down immediately.) The bass then stood out while the two guitars took on the tune, each responding to and supporting each other’s solos. Then Giles came back to the theme and that riff to bring back Ian for the close. This set the pattern for the arrangements to come. To my (non-musician) ear, Giles’ had sought to pare down the melodies to their essence, often carried by the bass, but used by all instruments to build their solos. Sometimes the interplay was between the two guitarists, sometimes between the bass and one of them, at others between all three. At different times each player led, followed, responded, soloed, stood out, then together they picked up the theme again and took the piece to its close. Supported by Roly’s encyclopaedic knowledge of the jazz canon, Giles introduced each number, acknowledging the composers / lyricists, giving some of the background (the film, the musical, the first or most famous artist to feature it, the 40’s ‘back to nature living’ Hollywood experiment behind Eder Ahbez’s Nature Boy etc.). Billie’s Blues was to be the closer, but the audience wanted more, so the trio obliged with a full-length Alone Together (by Arthur Schwarz and Howard Dietz for the 1932 Broadway musical Flying Colours). For me the only disappointment was that Roly didn’t break into song at any point, but that in no way detracts from the quality or enjoyment of an excellent performance way to spend an early spring lunchtime.